My daughter's school is running a competition to encourage children and their parents to make some underwater resources for the classroom. The theme is sea creatures. There's nothing like a little contest to bring out the competitive mum in me. So, we I set to work to create a stunning jellyfish to hang from the ceiling. Unfortunately, I'm not the most crafty of mums. But, I have to blow my own trumpet a bit and admit that I'm just a teensy bit proud of our efforts. This is such a simple project, that even I managed it. Blow up a balloon and try to rest the bottom of it in a mug. Unfortunately, you'll find that as you add the papier mache, it turns a bit top heavy and it won't stay in the mug, but it's useful to have as a sort of base. Mix up a mug of flour with a few splashes of water to form a paste. Tear up your newspaper into thin strips and dip them into the papier mache paste. Then stick them onto the top half of the balloon. Once you've covered the top half of the balloon in newspaper, tear up bits of your pink paper and a layer of pink paper to the newspaper layer. Leave to dry overnight. It might take longer if you've used a lot of paste! Cut the carrier bags into long strips and glue them around the base of the papier mache jellyfish body. Decorate with glue, glitter and bits of silver foil. 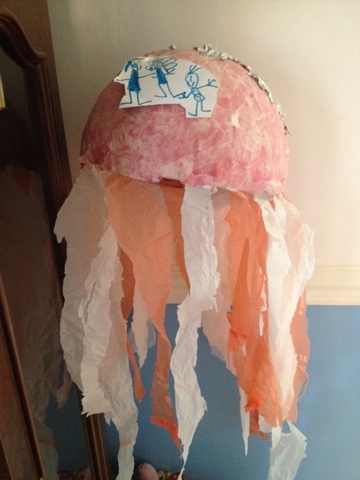 You now have a beautiful papier mache jellyfish. I'll keep you posted about whether we won anything. But it was a fun craft activity for my 4 year old and 2 year old. What craft projects have you recently done with your young children?